Remember how I said food has a story–well Shango Restaurant at 3260 Main Street in Buffalo NY, is shrouded in fiction and lore. As the talking drum sets the rhythm, the Balafon and Shekera start to play, heralding sounds that bring forth Shango, the great king of West Africa. He is a force to be reckoned with; dynamic and stimulating. His intelligence has no equal, and even his most fearsome rivals do not dare oppose his rule. With his masculine stature, his long legs and arms can reach from the heavens, protecting those under his care. His fingers cling tightly to the world below; the veins protruding as if he will lose what he has won. When Shango speaks, people listen. His thunderous voice strikes fear into the hearts of his enemies, but soothes the women and beasts. If he is angered, his eyes blaze red and fire shoots from his mouth. With several wives at his side, none compare to the beauty and tranquility of Oshun (click on the link for a review of this restaurant). She is the essence of life; static and calming, ever present but never moving. She is the goddess of the rivers and Shango’s ultimate prize. Their energies are yin/yang. For it is said, that without Oshun, Shango’s rage would burn out of control, destroying all he ruled over and all he desired. They compliment each other, generating new sparks of creation. And, it’s this spark of creation that has set Shango Restaurant apart from the rest. With its creole vibe and carnival style setting, Shango has done a great job of bringing the Bayou to Buffalo. As I’ve eaten here a few times now, it’s safe to say this place is on my “two thumbs up” list. First up on the menu was fried calamari ($ 10.00) juiced with red chili aioli and sided with pickled peppers (made in house y’all). My husband dared to try the chicken Andouille sausage gumbo ($4.50 for a cup). The white rice does nothing to slow the aggressive heat that builds in the back of your throat and follows your esophagus down to the pit of your belly. It’s got some kick. We also tried the avocado spring rolls ($8.00). By far my fave, the spring rolls were stuffed with sun-dried tomatoes, roasted corn, cilantro pecan pesto, seaweed salad, and topped with chili pepper garlic sauce. These are lightly fried however, so those with digestive sensitivities be mindful–not all spring rolls are springy and fresh. 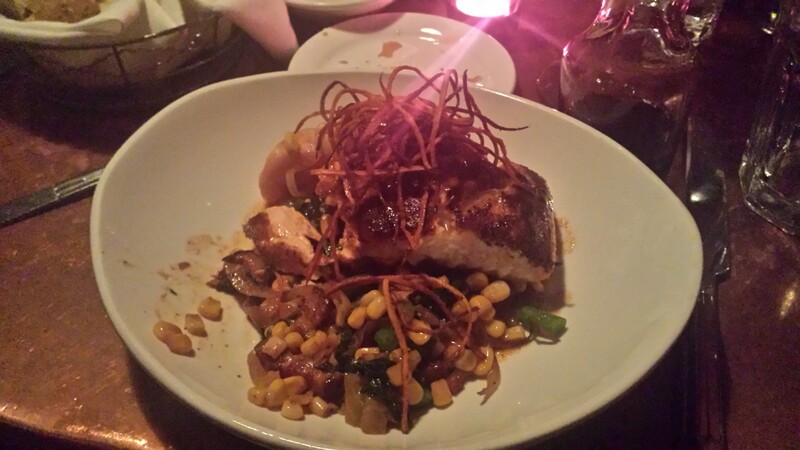 My main dishes consisted of Cajun seared salmon, with a corn and red kidney bean salad. This particular dish was a special on the menu and not served every night. I’ve also had the faro risotto ($16.00) with roasted root vegetables & Brussel sprouts, arugula salad, and pickled onion. This is a great dish for those with food allergies because it is not a heavy cream base (and upon request can be made with broth), and is gluten free. However, it is not cooked in a contained gluten free space, so please tell your waiter of your dietary needs. I had the opportunity to try the Buttermilk fried free range Chicken ($20.00). As you may have guessed, this dish was ordered by my husband, who salivated until it arrived. Topped with cheddar cheese grits, bacon braised southern greens and Andouille sausage gravy, this dish was very popular among our party. While it was indeed delicious, I could only take a few bites….you can understand why. This connection to the Crescent City is a winner among up and coming restaurants and should be tried by all! Pass the good time! Thanks for finally talking about > A Little Nawlins in Buffalo NY | SM Traphagen < Loved it!